The California franchise burger restaurant, CaliBurger has found a new home on the east coast, in Columbia, Maryland. All CaliBurger restaurants are franchised-owned and the franchise currently operating the restaurant in Columbia, MD, plans to add two more locations in the state next year. One will open in Annapolis at the Harbour Center, and a second in the northern Baltimore region where the company is actively looking for a location. Another 10 restaurants will open in the Washington, D.C., and Northern Virginia areas. A lunch trip to the Columbia, Maryland CaliBurger over the holidays was fulfilling and filling as my friend and I indulged in a sampling of the CaliBurger offerings. Our choices were their Cali Double-all beef burgers with the special Cali sauce, lettuce, tomato and choice of grilled or raw onions; Cali Spicy Chicken- hand breaded with spicy panko served with mayo, lettuce and tomato; the Portobello Mushroom – hand bread with panko served with their house made honey mustard, lettuce and tomato; and Cali Style Fries – seasoned fries smothered in melted real American cheese, grilled sweet onions and their Signature Sauce. The Cali Style Fries were addictive, rich and enough for two to share. The spicy chicken sandwich had its kick and the CaliBurger, reminiscent of the Big Mac was bigger and better. Groupon is offering $14 for $20 worth of CaliBurger edibles at the Columbia, Maryland location – a great way to go in with a friend for lunch, a munch or dinner. Beyond the menu, CaliBurger is quickly becoming a destination for gamers. Each restaurant is equipped with a video “FunWall” where consumers can play CaliBurger’s own line of mobile games – such as GemJump – against customers in other CaliBurger locations around the world. 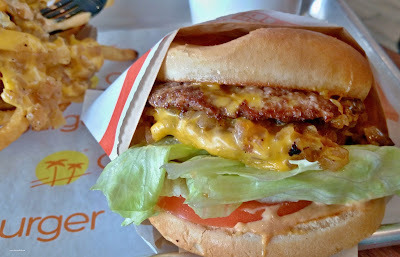 CaliBurger is a 21st century revival of the classic California burger joint. CaliBurger’s products feature the highest quality beef, buns baked fresh, top-grade chicken, hand-selected vegetables, zero trans-fat oils, sauces made in house, and hand-mixed shakes.